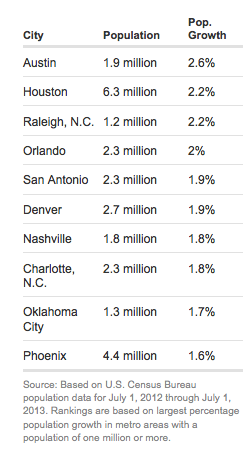 Nashville is among the 10 fastest-growing cities in the United States. Music City ranks as the seventh fastest growing city, with a 1.8 percent growth in population from July 2012-July 2013, according to data from the U.S. Census Bureau. The data puts Nashville’s population at approximately 1.8 million residents, reports CNN. Austin, Texas ranks No. 1 in population growth according to the data, with 1.9 million residents and a 2.6 percent population growth over the same time period. Austin is followed by Houston (6.3 million, 2.2 percent growth), Raleigh, N.C. (1.2 million, 2.2 percent growth), Orlando, Fla. (2.3 million, 2 percent growth), San Antonio (2.3 million, 1.9 percent growth), Denver, Nashville, Charlotte, N.C.; Oklahoma City, and Phoenix. Nashville’s Music Row, home to record companies, music publishers and music-related industries, is where some of the city’s 20,000 music industry jobs can be found, according to CNN. The robust healthcare industry is another significant attraction. An additional incentive for the influx of new residents is a reasonable cost of living, which is 14 percent less than the national average, according to Wiltshire.